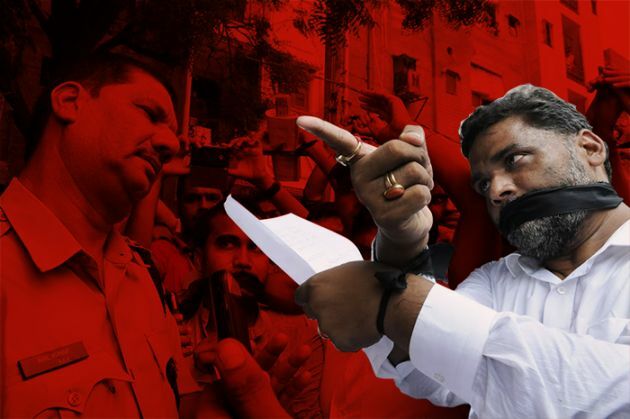 Home » Politics » Pappu Yadav: has the notorious muscleman become an ideal MP? Pappu Yadav: has the notorious muscleman become an ideal MP? Bihar MP Pappu Yadav has gone from being a bahubali to an active parliamentarian. He has intervened in 58 Lok Sabha debates. He has views on everything from floods and black money to the Islamic State. He intervenes to provoke, but his speeches lack substance. He launches frontal attacks on the government on all issues. His speech on BJP president Amit Shah triggered a furore. His parliament statistics cannot bury his past. He is still an MP with two dozen charges of attempt to murder, kidnapping, extortion, dacoity, criminal intimidation and theft. Pappu Yadav is not the first bahubali (muscleman) to enter Parliament. But he is definitely the first to earn the tag of a stellar parliamentarian. Parliamentary Research Service (PRS) statistics show that Yadav is the most vocal among Bihar's 40 Lok Sabha MPs. None of the state's other 39 MPs have participated in as many debates in LS, 58 in total, as the Member from Madhepura. From Indians abducted by ISIS to floods in Bihar, and from regulating private coaching institutes to bringing black money stashed abroad, Yadav has a view on everything. In his electoral career, Yadav has shown fickle loyalties. He is party hopper par excellence. He won his first Lok Sabha election in 1991 as an independent. In 1996, he won on a Samajwadi Party ticket and in his third term in 1999 he represented Ram Vilas Paswan's Lok Janshakti Party. His last home was Lalu Yadav's Rashtriya Janata Dal, which he also represented in 2004. He was expelled from the RJD in May 2015, after differences with Lalu Yadav on the Janata Parivar merger, the question of Jitan Ram Manjhi joining the alliance and the line of succession in the RJD. Yadav launched a new political outfit less than two weeks after his expulsion, called Jan Kranti Adhikar Morcha. Before his relations with Lalu Yadav broke, the RJD apparently used to think highly of him, although parties have always been little more than a popularity top-up for the man who calls himself 'the local Messiah'. The RJD had only four members in the present Lok Sabha, a 'small group' in terms of Parliamentary categorisation. Pappu Yadav was not the senior-most of the group. The leader of the party in the house is Taslimuddin, a five-time MP and a party hopper just like Pappu. But he is also a former Union Minister of State, a seven-time MLA and a two-time sarpanch. Taslimuddin's attendance in the current Lok Sabha so far is comparable to that of Yadav's, but he has not asked any questions and has not participated in any debates. Two-time MP and former Union Minister of State Jai Prakash Narayan Yadav is Pappu Yadav's senior in terms of age and association with their party. But he too has not been given the chance to speak in as many debates as Pappu Yadav. His current record stands at 31, nearly half that of Pappu's. Pappu Yadav even outshines his other colleagues from Bihar. With 22 MPs, BJP has the largest delegation from the state. There is only one member in this delegation, Ashwini Kumar Choubey, who comes close to matching Yadav's debating record. So what is it that has turned this MP with the fattest criminal record into a prolific debater in Parliament? What made RJD push him forward more than others? A key reason is his ability to launch a full-frontal attack on the NDA government. He does not pull his punches and lambasts senior leaders of the BJP without any hesitation. In August 2013, during a discussion on communal violence in the country, one of his statements on Amit Shah triggered such a furore that the Speaker was forced to ask him not to name people who were not members of the House. The Speaker also ordered Shah's name to be expunged from the records of the debate. On another occasion, during a discussion on black money in November, he roared at the treasury benches, "Tell your PM that if he has a 56-inch chest then he should make the first effort to end the nexus of black money between touts, middlemen, corrupt politicians and corporate houses." But apart from provocations, accusations, generalisations, a Sanskrit shloka here and an Urdu couplet there, there is very little that his speeches contribute to the debate. Frequently, these diversions take up the entire time allotted to his party. During debates on subjects that require carefully constructed analysis, criticism and suggestions, Pappu Yadav flounders. Speaking on the Judicial Appointments Commission Bill in August, he was vague and ambiguous in expressing disagreement with giving primacy to the judiciary in the proposed commission. His speech during the discussion on last year's budget, in July, was a rant about everything that is wrong in the country. The real debaters in LS are from outside Bihar. Amongst the top 10 in PRS statistics, four are from Kerala (Leftists), three are from Rajasthan (BJP) and one each from Odisha, UP and Gujarat. The top performer, BJP's P P Chaudhary, has a 100% attendance, has asked 177 questions and has participated in 95 debates. Pappu Yadav's statistics might overtake theirs too some day. But the objective of his efforts to be noticed as a Parliamentarian is to put his past behind. And there is a lot to bury and put behind - he has faced nearly two dozen charges of attempt to murder, kidnapping, extortion, dacoity, criminal intimidation and theft. Will Parliamentary statistics ever be enough to overshadow this record? This is a question that shouldn't really be put to Rajesh Ranjan, aka Pappu Yadav. How well do you know Rajesh Khanna?